Does Your Insulation Have Intimacy Issues? – Central Electric Cooperative, Inc.
Central Electric Cooperative, Inc. > Energy Efficiency Blog > Does Your Insulation Have Intimacy Issues? Perhaps more than you think! Building science has proved the thermal boundary (insulation) should be in continuous contact with the pressure boundary (sheetrock, subfloor, paneling, etc.). This is typically not a problem in the wall or ceiling of a structure that was insulated properly, since gravity assists in keeping the insulation in contact with the pressure boundary. That then leaves the floor, which is the main culprit in this topic of conversation. In 1992, the State of Oregon increased their energy code to require sufficient amounts of insulation in the floor, ceiling and walls of site built homes. While the amount of insulation that was installed could meet building code or greater, how it was installed can greatly diminish the performance of that insulation. This is common in newer homes with more recent styles of framing. In the past it was common to see a 4”x6” floor joist, which leaves a 5.5” floor cavity to fill with insulation. This would mean that an R-19 or R-25 fiberglass batt would fill the cavity and be in contact with the subfloor. Today we see more advanced types of framing, such as a TJI (Truss Joist I-Beam) which is represented in the picture. This new framing typically creates a deeper floor cavity, sometimes close to 10” or 12”. With the cavity larger, and the insulation code requirement the same, you are left with insulation sitting at the bottom of the floor joist cavity and not in contact with the subfloor. Imagine someone holding your blanket six inches above you all night long, you would be quite cold. This is similar to the concept of the pressure and thermal boundary being in continuous contact. Just as the blanket would not keep you warm if it was above you, the performance of the insulation sitting at the bottom of the floor cavity is greatly diminished. Depending on the type of insulation and how it is installed the performance could be diminished by as much as 50 percent. The good news is a solution does exist, which does not involve taking out the existing insulation. A new fiberglass batt can be added to the floor joist cavity, raising the existing batt into contact with the subfloor (a process called back-filling). With the insulation performing as it was designed, the result is a warm floor and improved energy efficiency. 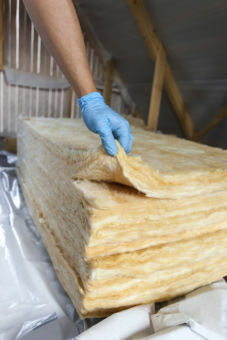 To learn more about this process or insulation in general, call CEC and ask to speak with one of our Energy Specialists.